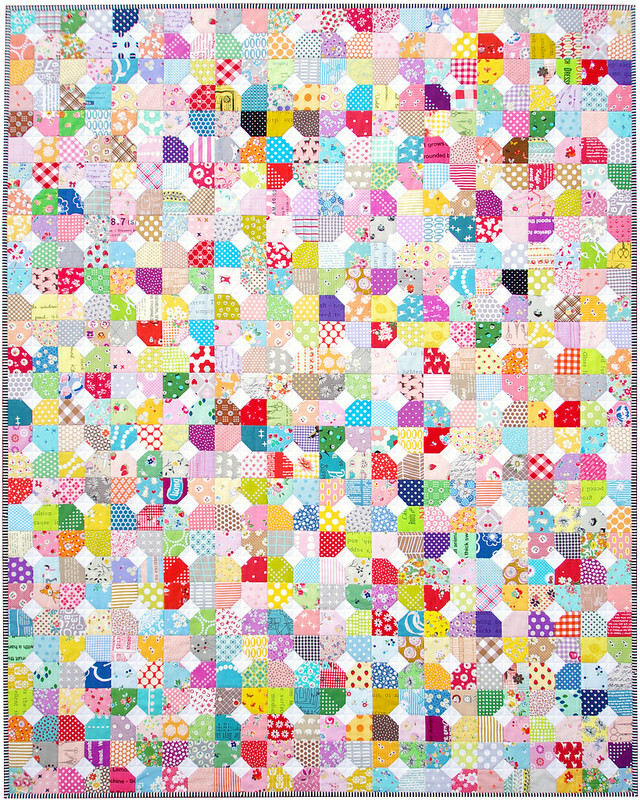 You know it has been a good week for me when you see a finished quilt made from "scrap" and from stash. I LOVE working from stash and with fabric combinations that seem unlikely; mixing the old with the new, traditional prints with modern prints, and playing with color combinations. 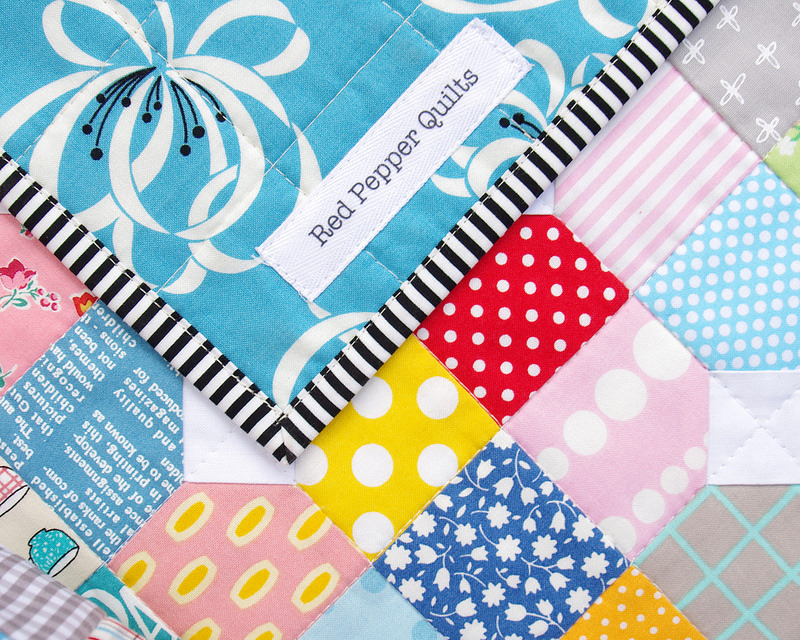 thereby allowing the fabrics and the quilt design to weave their scrappy magic. 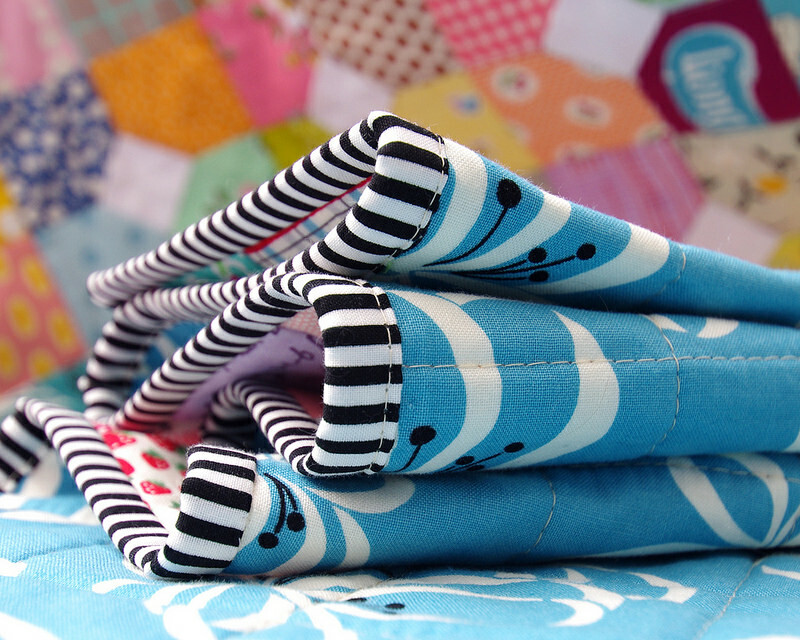 It has also been a good week when I can challenge myself by sewing 720 inset seams and still love sewing! That was a lot of start, stop, and back-stitch sewing, but I really do enjoy the repeat process that is block sewing and I am super pleased with the outcome. 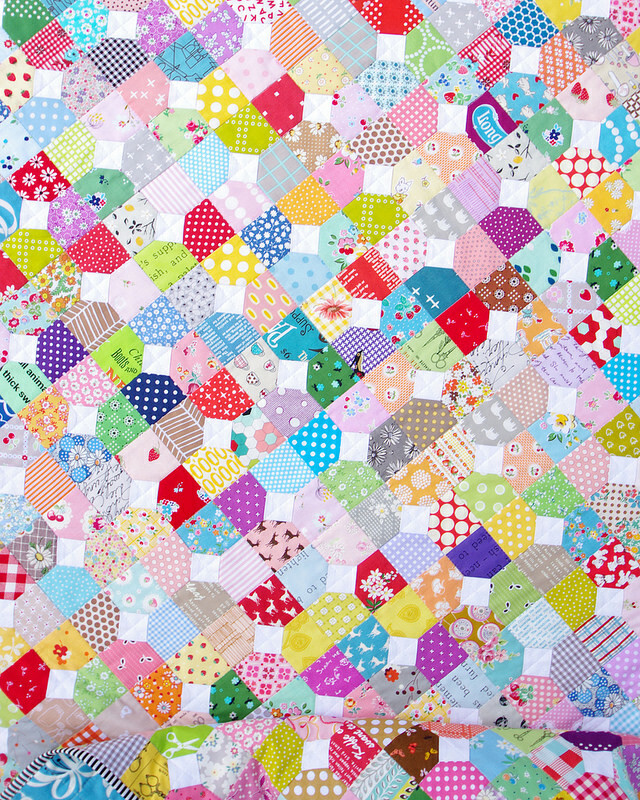 The quilt came together really well, with all seams nesting neatly, which made for a smooth and flat quilt top. 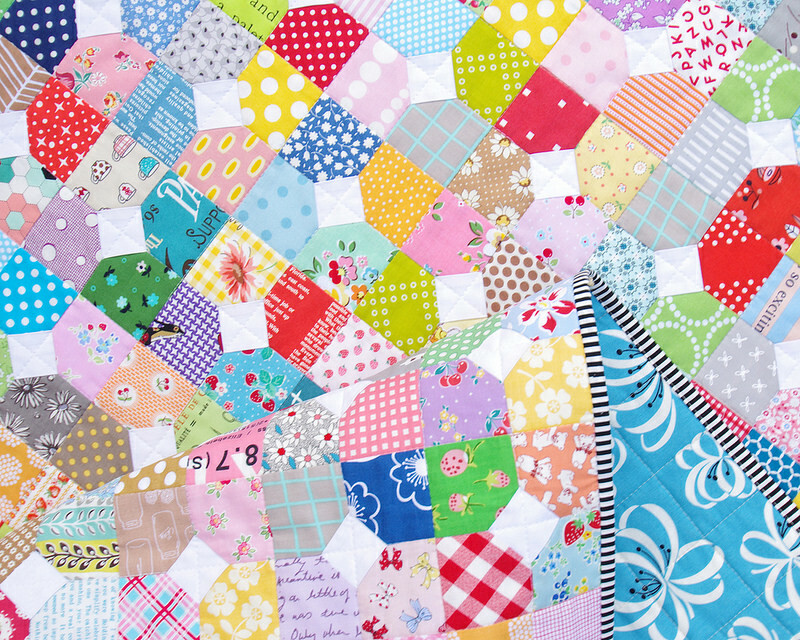 In keeping with my usual quilting style I have quilted this quilt by ditch stitching the seam lines of all the Bow Tie blocks, then adding another row of quilting through the center of the block, effectively creating an all over grid of 2" squares. 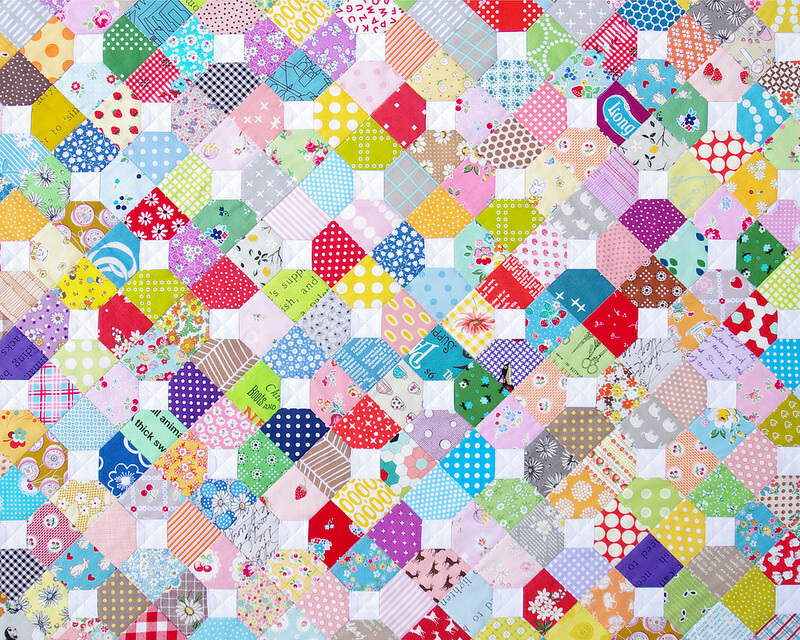 This gives the quilt a subtle texture and although not otherwise decorative it serves its purpose - to keep the quilt layers together - well. 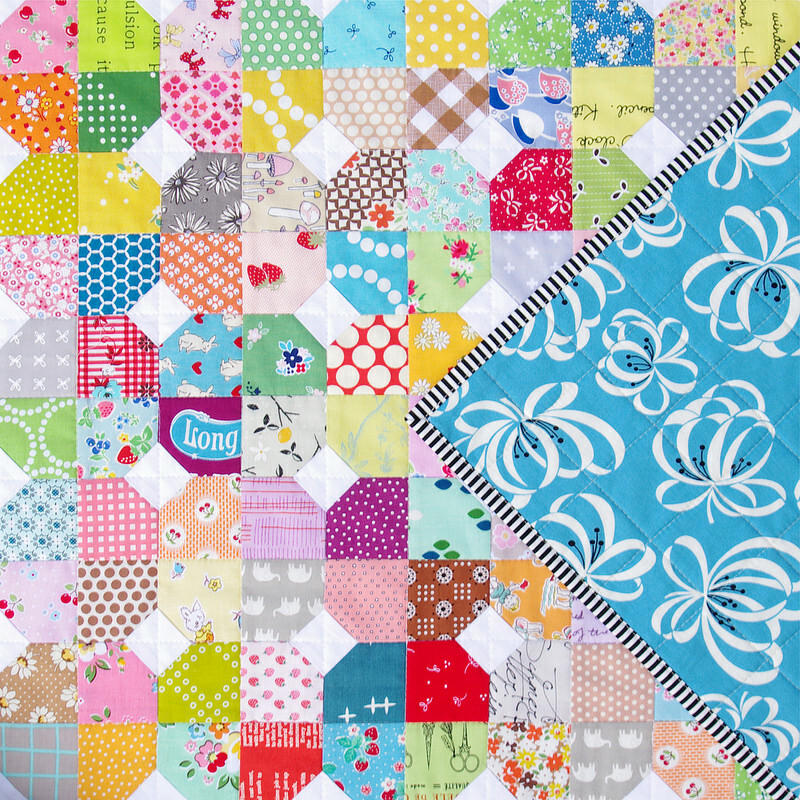 For the back of the quilt I have used my favorite print from the Katie Jump Rope collection by Denyse Schmidt: Flower Ribbon in Blue. 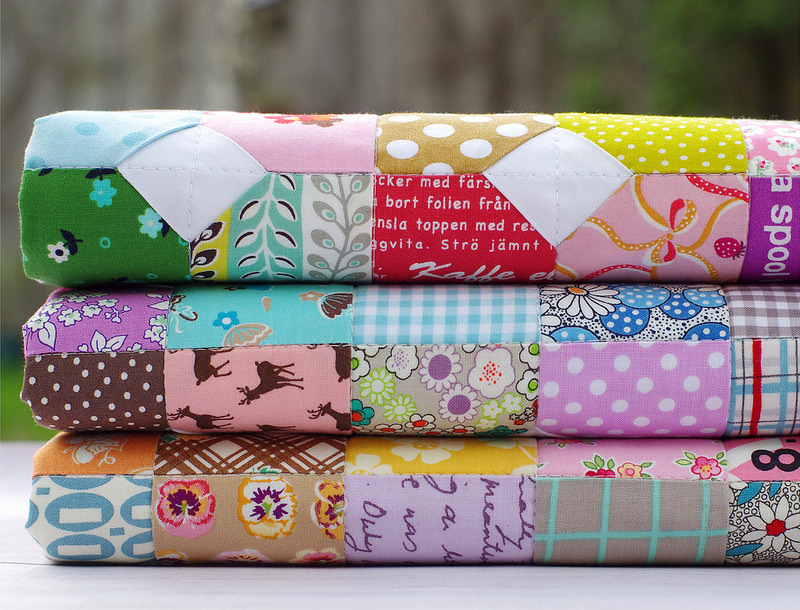 I am so glad this collection was reprinted and I have stashed yardage. Some of these prints are already hard to find. 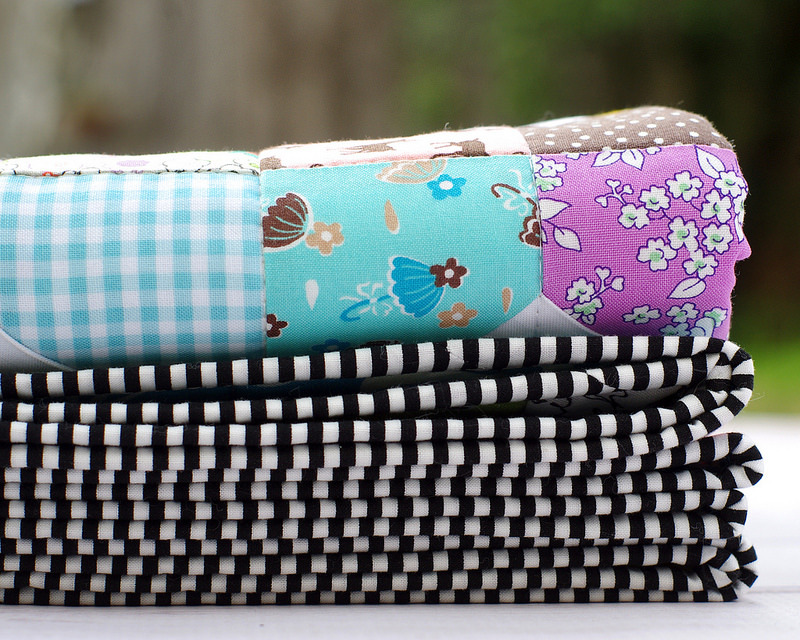 I could not resist using my go-to stripe fabric for binding ~ a black and white stripe by Timeless Treasures. The binding is entirely machine stitched. (Machine stitched binding tutorial here). 180 blocks each measuring 4.5 inches x 4.5 inches (incl. seam allowances). More than 220 different fabrics. small scale designs, and text prints. Solid fabric is Robert Kaufman Kona Cotton in White. 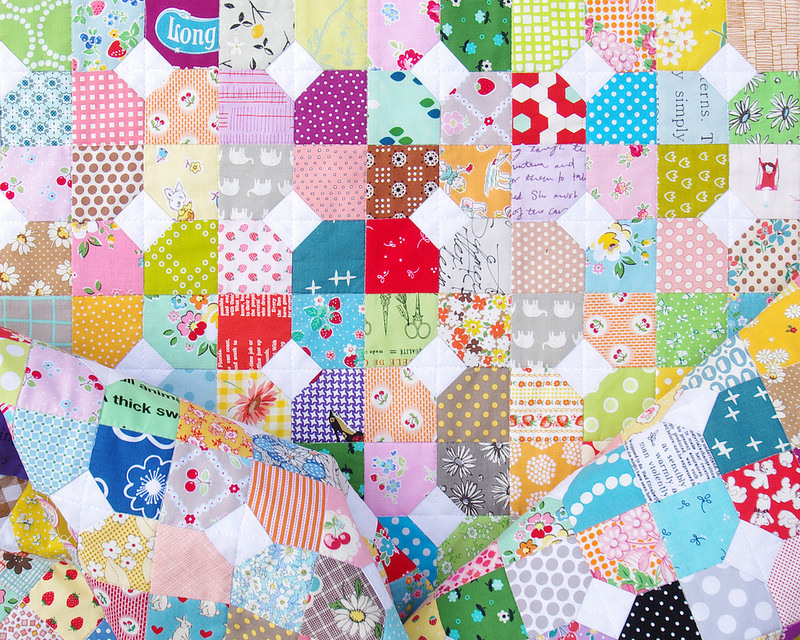 The Scrappy Bow Tie Quilt is for sale and is listed in my Etsy Store. 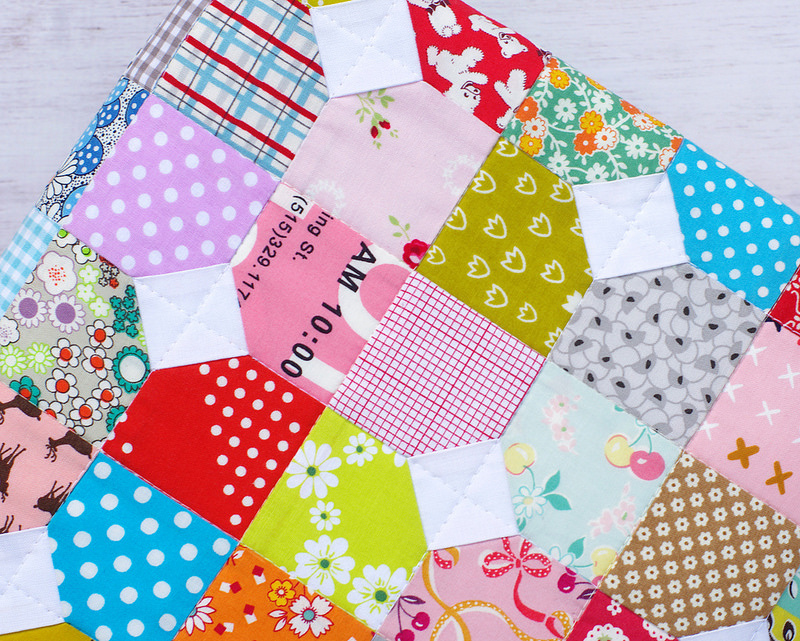 Scrappy Bow Tie Quilt - work in progress (includes Bow Tie Block Templates). Kansas Dugout Block - tutorial with inset seams. "720 inset seams" for me translates to "I'll come back to this one day" and then never do. 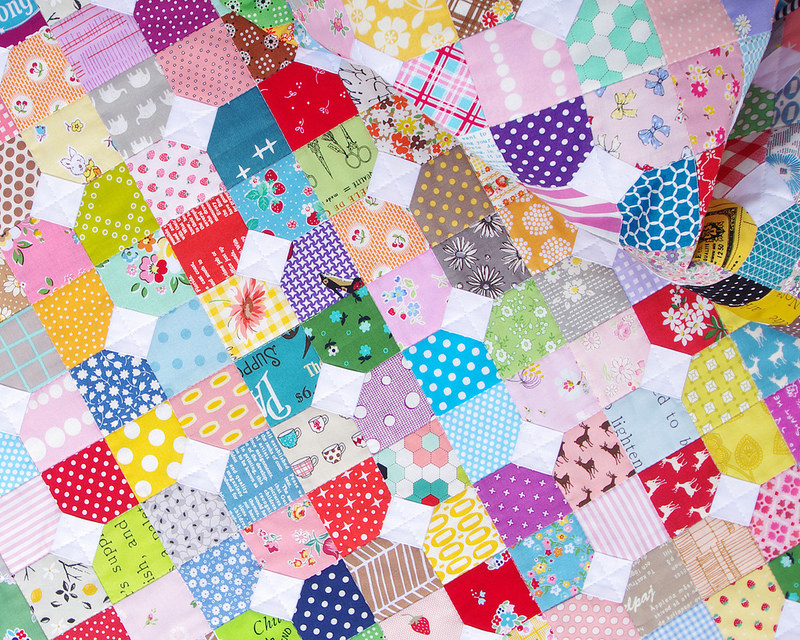 I love traditional bow tie quilts! Congrats on machine sewing yours. Mine have all been done by hand and much smaller. 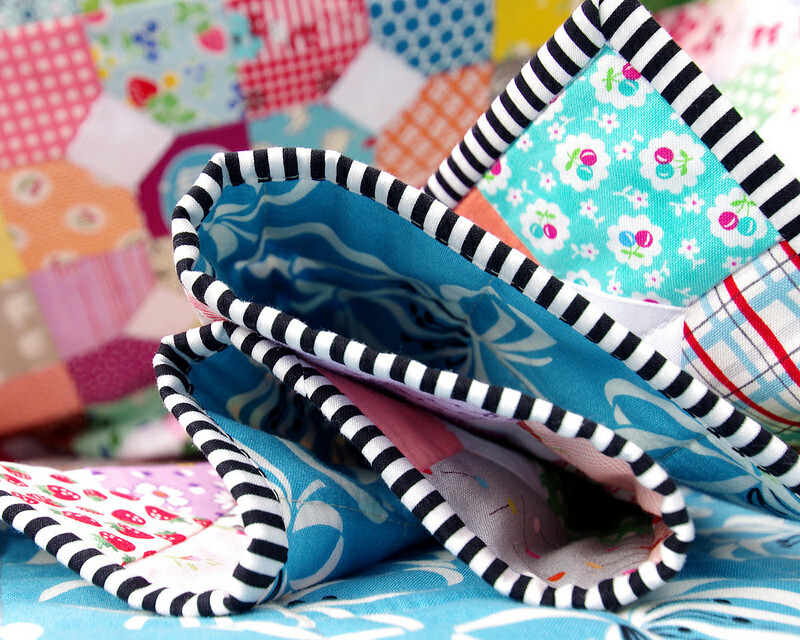 One I raided scraps from friends cast offs and made mini 3" blocks and called it friendship ties! 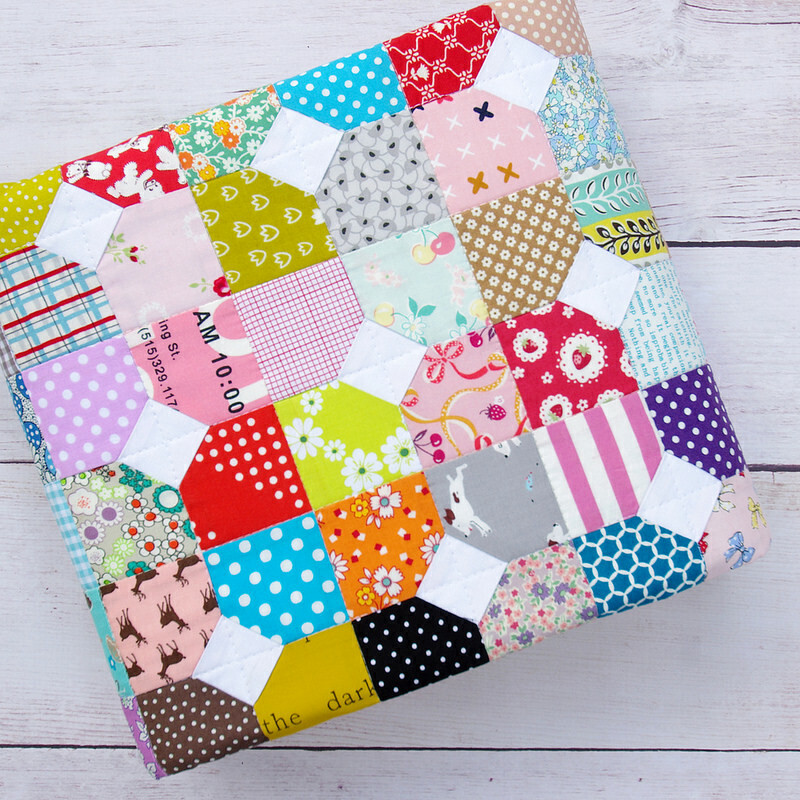 Your binding tutorial is the best! I can successfully sew entirely by machine now! Another beauty, Rita! So many fabulous pieces of fabric in this one! Your specialty, I know, but always exhilarating to see!!! you are incredibly focused and talented Rita. 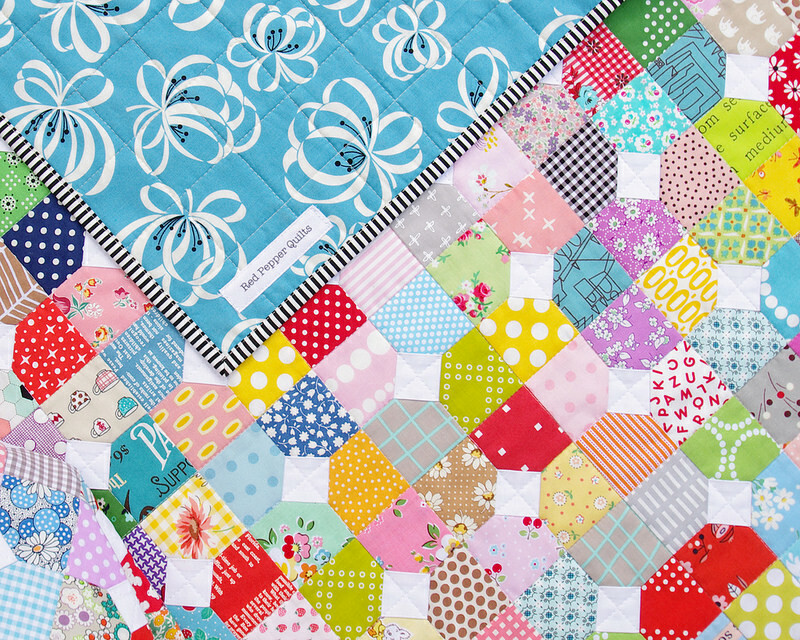 Such a happy quilt and I love your backing fabric.